7.9 US gallon plastic conical FastFerment eliminates racking and transferring by doing primary and secondary fermentation in one vessel. Move over buckets & carboys, FastFerments are taking over! Our 7.9 gallon conical fermenter eliminates racking & transferring by doing primary & secondary fermentation in one vessel. The FastFerment System is a one-stage fermenter, which allows brewers and winemakers to do primary and secondary fermentation in the same unit. FastFerment eliminates racking and transferring between buckets and carboys. This saves approximately 80% of the time and labor needed to make a batch of beer or wine compared to traditional methods. With less equipment, clean up is easy. You need to time the flushing of the sediment perfectly to ensure minimal loss of product. As the sediment is flushed out, there will always be yeast and the sediment hazes that float up into the product remaining in the unit. Options Equipment only. 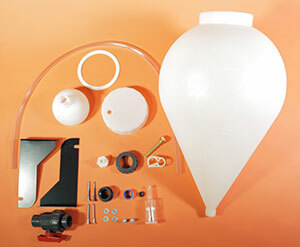 A complete FERMENTASAURUS start-up equipment package for making wine or beer. No wine or beer mix. Select the start-up package you require.